If you really think you are a good manager, decision maker and a team player with well-developed negotiating techniques; MBA is one of the options you can pursue after your graduation. Within your dreams and aspirations, find your opportunity to be a part of the best MBA Colleges in India. With the availability of best infrastructure, academic facilities, qualified and experienced teachers “SRM University Delhi-NCR, Sonepat” is considered as one of the top MBA Universities in India. To join one of the colleges in India, candidate should be a graduate from a recognized University with 50% marks in aggregate. Students have to qualify the SRM Haryana Common Admission Test, conducted by SRM University Delhi-NCR, Sonepat. Students who qualify CAT, NMAT by GMAC, CMAT, GMAT MAT, XAT, SNAP can apply directly without appearing for the common entrance test conducted by the university. 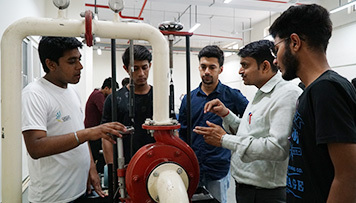 SRM University Delhi-NCR, Sonepat provides experienced management faculty from top institutions who follow a revised curriculum, pedagogies, and management education process. Being one of the best institutions for MBA; SRM University Delhi-NCR, Sonepat offers the best infrastructure, campus facilities and professional atmosphere to its students and also well-equipped labs for research to well-furnished auditorium and transportation. A free booklet kit is provided to the students to train them for C/C++. The aptitude and quiz software is given to them by uploading it in all the labs and self-assessment access in all the student’s laptops. To sharpen the maths aptitude of all the students, the college circulates free maths booklet of materials and also upload the soft-copies in all the labs. The college also provide the training material uploaded in Student’s laptops for self-assessment. In order to groom the overall personality of its students, the college focuses on providing soft-skills training, self Motivation Program, Group Discussion & Self Confidence Building courses. MBA Students of SRM University Delhi-NCR, Sonepat enjoys excellent placement with reputed organizations visiting every year in the campus. More than 90% of MBA students bag campus placement every year which suits their interests, skills and specialization. The highest salary package gone last year is Rs. 10 lakhs per annum from BYJU, the learning app company. The Campus has separate hostels for boys & girls along with well-furnished rooms which are spacious with AC & Non-AC facilities. The campus also provides pharmacy, stationary & provisional outlet. Also, the campus is equipped with providing gym & indoor games for its students. While pursuing an MBA course from SRM University Delhi-NCR, Sonepat, all the management students will be provided with an industrial training in relevant organizations in order to get a live experience in their particular specialization. To help with funds, students can also avail the loan facility extended to them in order to finance their MBA course for helping them to achieve their dreams. The college also provides scholarship facilities to the meritorious students and seek admissions from the students qualifying 50% of the merit criteria in their respective graduation from a UGC recognised University. The college also reserves 25% of the total seats for the Haryana domicile candidates for them to avail scholarship. The scholarship is available to students who qualify national level entrance examination SRMHCAT -2019. At last, being one of the top MBA Universities in India, SRM University Delhi-NCR, Sonepat transforms their students to face the real world challenges. The university not only prepares them for the professional world but encourage them to chase their dreams. Delhi is a hub of education in north india and capital of India and SRM University are best engineering institutes in delhi. In delhi, Many institutes in delhi are providing graduate and postgraduate courses but SRM university in delhi ncr are offering all graduate and post graduate courses at affordable fee structure as much as to another institutes in delhi. Delhi is the collection of mix cultures and there people from various regions and states india, that means delhi is a colorful state. Delhi is a collection of many engineering courses and branches. Many foreigner students comes in india and take admission according to own interested colleges and engineering branches on NRI Quota.